Intel began promoting its first commercial drone in the U.S. this week, as it seeks to carve out a place for itself in the fast-expanding market. The Falcon 8+ drone, which was announced two weeks ago, was on show at the Commercial UAV Expo in Las Vegas that opened on Tuesday. Intel has been building its drone expertise throughout the year with a series of acquisitions, and the Falcon 8+ has grown out of its January purchase of Germany's Ascend Technologies. The drone has eight rotors arranged in a distinctive V-shape, designed that way so the rotors at the front don't get in the way of a payload, said Natalie Cheung, a drone marketing manager at Intel. "We’ve really thought about what are some of the issues commercial customers face today and when they want to get that crisp, hi-res image, you don’t want any of the rotors in the image," she said. Redundancy is a key feature of the device -- it can continue flying even if up to two rotors on either side stop spinning. The autopilot has three different inertial measurement systems, so if one suffers from interference it can keep flying. It also take two batteries and will seamlessly switch power sources when one is exhausted. Intel also debuted a new controller. "It’s much more compact and we’ve really thought about the user interface for this," said Cheung. Called the Intel Cockpit, it's a completely new design that replaces a previous one that was based on a model airplane controller. It has a single joystick to control the drone and a second joystick to control the camera payload. The drone is one of a number of steps Intel has taken in the drone market this year, which began with CEO Brian Krzanich declaring at CES that "We believe we’re truly on the verge of a drone revolution." 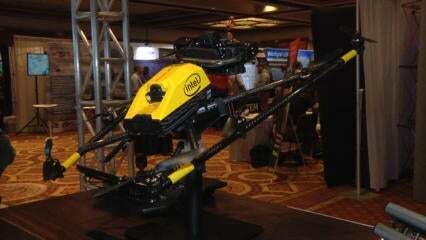 Intel CEO Brian Krzanich shows the Yuneec Typhoon H drone with Intel RealSense at CES in Las Vegas on Jan. 5, 2016. Later that month, Intel acquired Ascend Technologies, the company behind the predecessor to the Falcon 8+. This year it's also launched a drone development platform called Aero, acquired drone vision processing company Movidius and, earlier this week, said it is buying Mavinci, a German-maker of flight planning software.